(Newser) – Today's a big day for China and Taiwan: They held their first talks since 1949, when the People's Republic of China was formed after a civil war. Since then, they've been perpetually frosty; China has continued to consider Taiwan its territory (albeit a renegade one), and has threatened force if Taiwan declares independence. 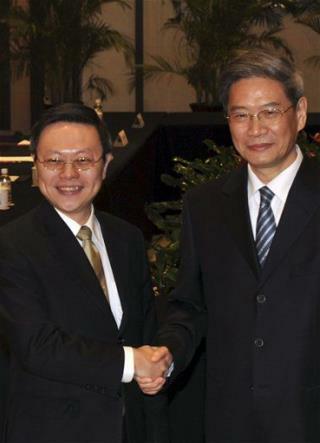 But today the head of Taiwan's Mainland Affairs Council met with the head of China's Taiwan Affairs Office, and they agreed to set up representative offices for both organizations, Reuters reports. The official liaison offices will exist on one another's territory. (R) 2016 Gov. RICK PERRY Report: Of course American Republicans and the Western Europeans like to see an Multi-parties of "one" China's unification, then the United States could end our American TRA (Taiwan Relations Act of April, 1979) and reduce tension between the Taiwan Strait since mainland China has its aircraft-carrier deployed and Super-Supersonic Speed (nuclear warhead) missiles are aiming at Japan. One must pull the hammer away before striking the nail.